Recently, one of my clients and I were talking about the possibility of mixing up the countertop materials in her kitchen remodel. She has a small island, which offers the perfect opportunity to switch things up from what's on the perimeter. 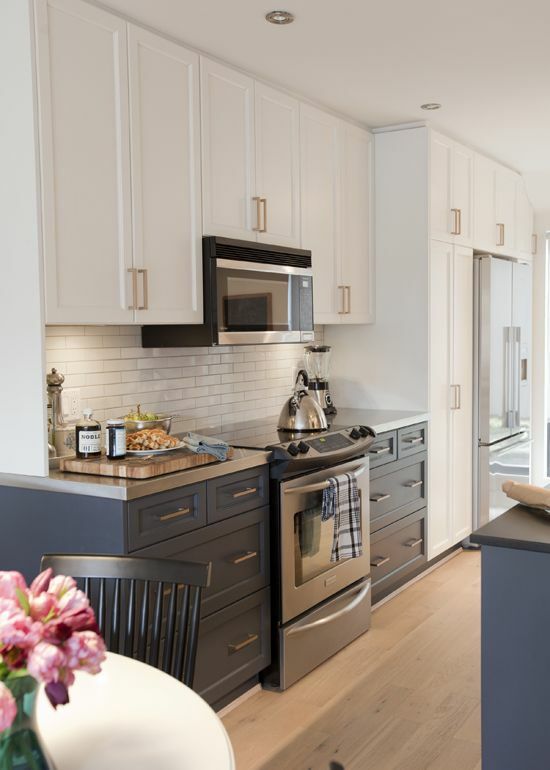 Our kitchen has a small taste of this mixed and matched look - we used butcher block on a small section of shallow cabinets and a marble-like quartz on the rest of our countertops when we renovated in 2016. I love the look, and you can see how it turned out in this post! I realize that this mixed-and-matched look might not be for everyone, but if you're thinking about (or in the midst of!) a kitchen remodel, you may want to think about if it might be right for your home. The images I have throughout this post are great examples of mixing countertop materials well - I hope they leave you feeling as inspired as I am! 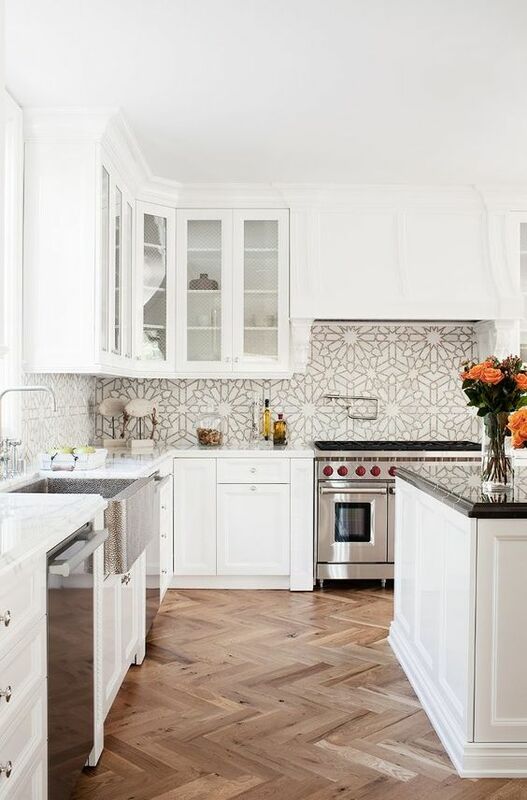 So when should you consider using two different types of countertops in your kitchen? You want to make your kitchen feel more custom and unique. You'd like to stretch your budget (this depends on the materials you choose of course!). You're looking for a way to add some visual interest. You have a section of the kitchen that feels separate and would offer a natural spot for something different like an island. Even if you have a straight-out-of-the-box kitchen, your countertops are an opportunity to change things up and make it feel special! 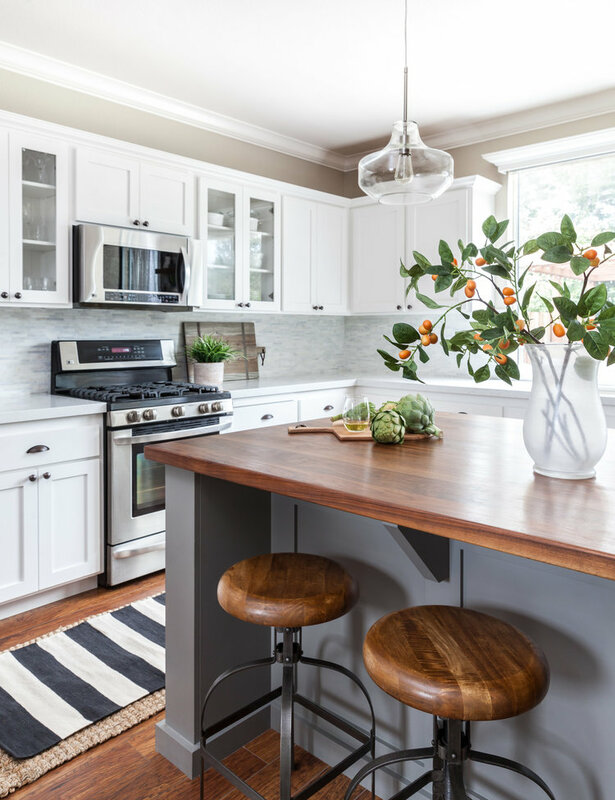 Designer tip: One great way to make your dollars go farther in a kitchen remodel is to use butcher block as one of your countertop materials. It's inexpensive, adds warmth, and pairs beautifully with other materials. Going with a less expensive material in one area allows you to splurge on a higher end material like marble or quartz in another area. What countertop materials should you think about mixing together? The sky is pretty much the limit! This is where you can get creative. 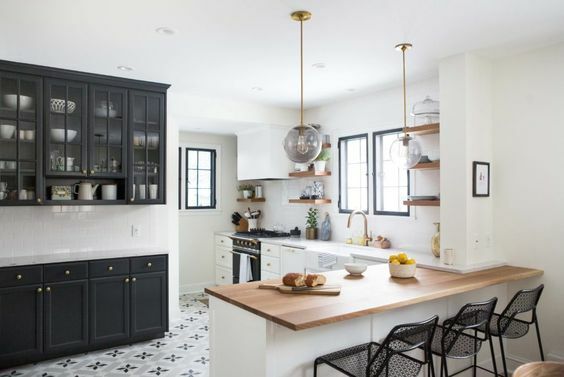 Some of the more common combinations I've seen are marble (or marble-like quartz) and butcher block, marble and soapstone or black granite, or concrete and butcher block. A more unusual material combo that I think could be amazing in the right home is stainless steel with marble-like quartz. The key is to choose two materials that will coordinate, but have enough contrast to look distinctly different. Pair dark with light, veining with a more solid countertop, or busy with subtle. Also, make sure you consider surfaces that are practical for the tasks you'll need to do in that area. 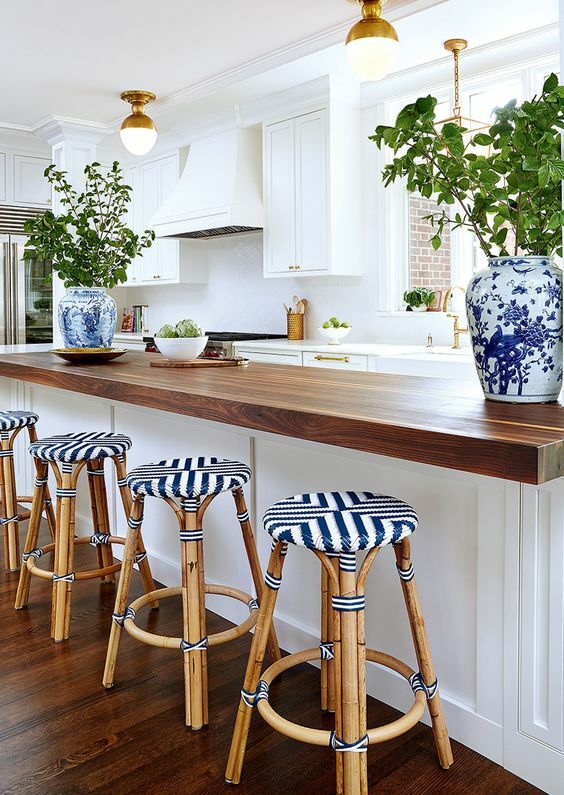 For example, butcher block and marble require more maintenance and upkeep - especially if they are near areas that will get wet like a sink or messy like a heavy food prep area. Depending on how much "character" you can tolerate, you may want to opt for something less porous like granite or quartz for spots that are heavily used and save the higher maintenance material for a lighter-use area. One thing I wouldn't do in a home is mix laminate with a natural stone or quartz. Even though laminate has come a long way in terms of mimicking higher end materials, if you put them next to each other, you'll spot the difference right away. This will cheapen the look of your kitchen, and no one wants that! I'll leave you on a happy note with a few more beautiful kitchens that I spotted that have mixed and matched countertops. Enjoy! So tell me, are you bold enough to mix up the countertop materials in your home? Or have you already? For those of you who have a couple of different ones, how do you like the look? If you need help with your kitchen redesign, be sure to check out my e-design services!